Read this interesting article from BBC News about witch markings! You'll be £19.99 closer to your next £10.00 credit when you purchase Accused. What's this? The image of the witch - crook-nosed, unpleasant of disposition and with a penchant for harming her neighbours - is well established in the popular imagination. For hundreds of years the accusation of witchcraft has been levelled against women throughout the British Isles: such women were feared, persecuted, revered and reviled, with many ending their journeys at the stake or noose. Far from a mass of pitiable, faceless victims however, each case tells its own story, with a distinct woman at its heart, spanning the centuries down to the present. What did it really mean to be accused as a witch? Why, and by whom, were such accusations made? Was it possible to survive, and what awaited those who did? Prepare to delve into the captivating history of witchcraft with an in-depth exploration of some of the most fascinating and notorious women accused of being witches from across the British Isles. On a journey from 14th century Ireland to 20th century Hampshire, Accused examines the why, the how, and, most importantly, the who of these tantalising and evocative cases. Using trial documents, contemporary pamphlets, church and census records and a wealth of other sources, eleven accused women are brought to life in a biographical approach that will take the reader back in time. Meticulously researched and skilfully and painstakingly woven, this book will be indispensable to anyone with an interest in the popular topic of the history of witchcraft and a love of fascinating and diverse individuals. Setting each of the “accused” in their social and historical context, Willow Winsham delivers a fresh and revealing look at her subjects, bringing her unique style and passion for detail to this captivating read. Once you read this book it will be hard to put it down, not only do you learn about the people in the story but you will also learn a little history that surrounds them. Finding as it was hard to be a women back then and sometimes being a single mother fighting society and men for just survival. The pressure they must of been under emotionally just to survive when no one would come to their aid to defend help them. Read about the accused and then decide your verdict, innocent or witch. This book looks in depth and focuses on eleven cases of women who have been accused and tried of witchcraft from the 14th Century to the 20th Century. Each case appears to have been carefully selected by the author as they include cases from England, Ireland, Scotland and Wales, showing that accusations of witchcraft was not just focussed in one area of the country. By selecting and researching different time periods the author highlights the different views and attitudes throughout the centuries. However, I did feel that there was a too large a focus on the 17th century and it could have possibly included a few more cases from across the centuries. Each of the cases has clearly been thoroughly researched using original archive resources with a detailed bibliography and notes section. Each case builds up an image of how life was for each of the women and gives an important insight in to what their position was in the social structure and what was the catalyst to them being accused and tried for witchcraft. After going in to depth presenting the evidence the author allows the reader to make their own mind up as to whether there was any supernatural behaviour involved or whether each individual was a victim of circumstance. The writer has gone an extra step whilst researching the cases and has followed up with what happened to each of the individuals in each instance. This is a nice way to complete each case so that the reader is not left thinking 'what happened next?' Throughout this book you can certainly see the author's passion for research, history and love of storytelling, combining the three elements makes it a must read for anyone with a fascination for the supernatural, history and of course witches. A very readable book with some fascinating detail about testing those accused of witchcraft and the trails then ensued. Was revenge and unpopularity to blame? Why not read the book and decide for yourself. The book is highly readable, and uses a good range of archival and bibliographic sources, including the work of Malcolm Gaskill, whose books in this subject are highly recommended. In presenting these accounts, Willow Winsham goes beyond just reporting the details of the claims, counter-claims and trials. She shows the protagonists as real people rather than just historical elements, looking in depth at the characters concerned, their relationships, their family backgrounds, and the society in which they lived. Although written in a very readable and entertaining style, this is a scholarly work, and the author has researched her subject widely, as the extensive collection of notes and references testifies. A fascinating insight into the deeper stories behind figures lying on the fringes of history. Highly recommended. Trial documents, pamphlets, census and church records and more were used to explore the cases of women facing a terrifying accusations: that of witchcraft. Willow Winsham presents the facts behind the shocking real-life cases of 11 women accused of being witches, from 1324-1944, placing each in their social and cultural context. I enjoyed this book immensely and the account of Jane Wenham, the witch of Walkern in Hertfordshire provides some intriguing accounts of what happened to Anne Thorn and others. were - and are - considered wrong by the authorities. A history book that looks at real people in the context of an almost inquisition-like persecution. Fantastic. Willow Winsham has made full and good use of the sources available, from trial documents and contemporary pamphlets to parish and other documents. Usually these witch stories are mentioned in passing, often with little more detail than a name and place and date. Even when the account is longer and more detailed, it is rare to get a real feel for the people, time and place. Willow Winsham puts flesh on eleven cases, brining these eleven women to life, presenting their biographies. Winsham is a solid researcher and capable writer who tells her stories in their proper social and historical context. This an incredibly well researched and cleverly put together book, and fascinating with it. 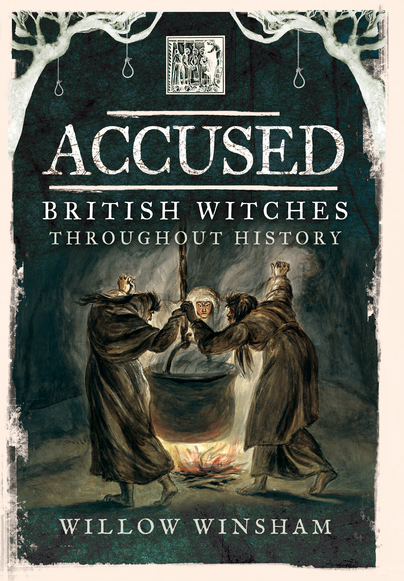 Accused is a series of studies of just a few of the witches of our history, each one explored in great depth, giving details not only of the accusations levelled against the so-called sorceress in question but also her life. Each paints the picture of the woman and the time in which she lived, providing insight into the social structure of the time (such as how a woman might be demoted from the title 'Mistress' to that of 'Goodwife'), the effects of economic instablity, fears of divine retribution ~ and, sadly, how easily events could be manipulated by those higher up the social strata for their own benefit, as in the case of Joan Flowers. She was accused of causing the deaths of the two heirs to the title Earl of Rutland, but others suggest that the deaths were caused by the man who sought the hand in marriage of their sister, who would, thus, bring the lands with her as a dowry if her brothers were no more. Willow Winsham talks of the swimming of witches, the ducking stools, the rarity of burning in this country, and of corsned, something I hadn't heard of before, which involved the 'witch' eating consecrated bread to see if she could swallow it. Then there is Isobel Gowdie and her Scottish coven, the case of Welsh witch Gwen fetch Ellis, and possibly the most well-known English witch, Jane Wenham. The book moves into the 18th century, when belief in witchcraft itself was outlawed, leading to more support for anyone, like Susannah Sellick, who was accused ... and then to the case of spiritualist Helen Duncan, in 1944, who strikes me as being little more than a charlatan aiming to make money from people who had lost loved ones in the war. However, one thing I noticed about this books is that, to a certain extent, Ms Winsham leaves the reader to make up his or her own mind as to whether or not certain whisperings of the supernatural kind might have been present at any one time. I liked that. A stunning and admirable piece of work, highly recommended.